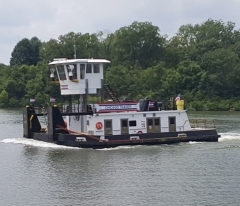 Tow Boats — J Russell Flowers Inc.
With many years of vessel design and construction experience, J. Russell Flowers, Inc. has developed standards of excellence in the world of inland marine towboats. We know horsepower! Our boats are most normally constructed with fuel tank segregation from from the hull sides, stainless steel exterior doors, carefully planned piping and electrical systems, and comfortable crew quarters. Propulsion systems are robust, with heavy, high DAR propellers, and leak-proof mechanical shaft seals. Most people think towboats are built to last 40 years. We think our boats will last a lot longer.